The Wind Rises. I love that title. While we still have a few years until this new Studio Ghibli film hits US theaters, it's landing in Japanese theaters this July. Which means marketing is kicking in over in Japan, and a series of gorgeous new very wide banners/billboards have debuted for the film. 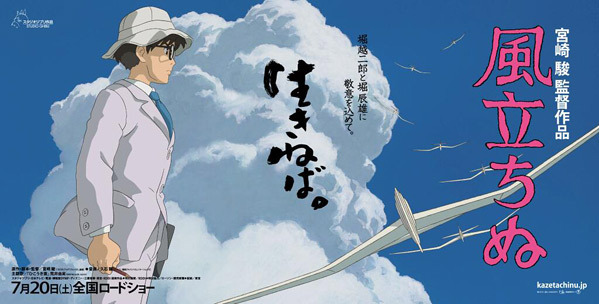 Hayao Miyazaki's newest feature The Wind Rises is a look at the life of Jiro Horikoshi, the man who designed Japanese fighter planes during World War II. We've seen bits of concept art before, but these banners show not only the main character but the incredibly beautiful landscapes and airplanes Miyazaki has created for the animated film. 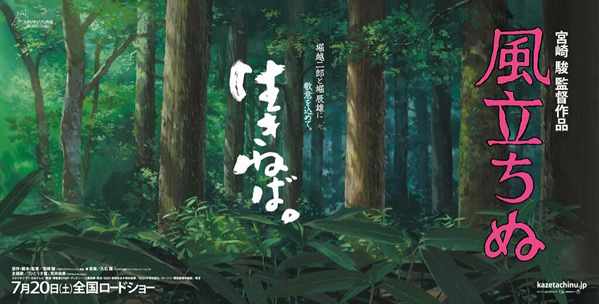 Here are the four new The Wind Rises posters, officially debuted by @ghibli_intl on Twitter this weekend. 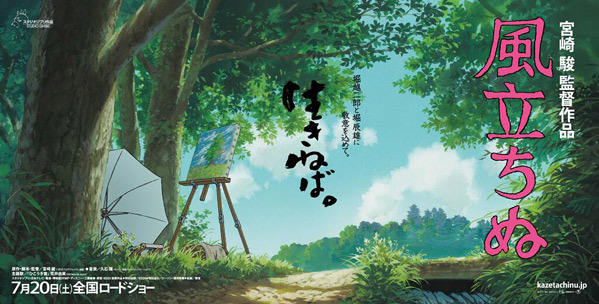 Studio Ghibli's next film, with the legendary Hayao Miyazaki at the helm, will be called Kaze Tachinu or The Wind Rises. 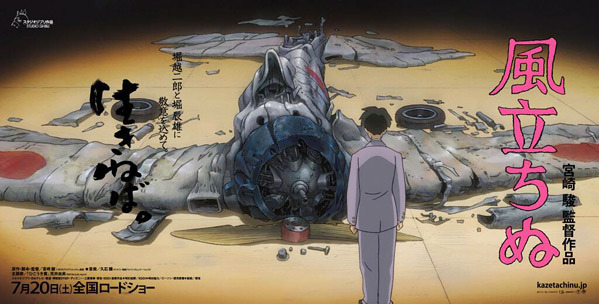 It's an adaptation of Miyazaki's most recent color comic as well as a novel by Tatsuo Hori, about the man who designed the Zero Fighter airplane which was used in World War II. Hideaki Anno will voice Jiro Horikoshi. The Toho Company has the film set for release on July 20th in Japan, but we're not sure about any US plans just yet. Stay tuned. For those interested, follow the @ghibli_intl account for additional updates. In one of their recent tweets, they state: "the Studio Ghibli Int'l Team is hard at work to bring you #TheWindRises as soon as possible after the Japan opening on July 20!" I'm very excited to see it. I love these films so much, but my 3, 7, and 10 year old kids just don't appreciate them. I don't know why, but I just can't get them interested in any Miyazaki film, but they'll gladly watch Cars a dozen times. I will not give up the fight though! My son was the same, but he recently got into Totoro and Ponyo, even sings the Totoro theme song which is great. With a movie like Cars, your child like mine, will already have been hit with a lot of advertising long before the films release, also the stories are pretty bland too. I did see the concept art for Cars though at a Pixar exhibit and the background rough paintings were beautiful. Ghibli movies are quite strange, often there is no straightforward good or bad character in there either, which makes it hard for young children and a large amount of adults to understand. Haven't tried Ponyo yet, but I'll give that one a shot next. Struck out with Spirited Away, Howl's Moving Castle, and Princess Mononoke so far. Just get em to watch Grave of the Fireflies, sure they'll love that. 🙁 It's very hard to explain to a child that a Disney or Pixar film is inferior to another animation as they are sold as the best animations in the world at the moment. You've given it a go and maybe the seed will have been planted Matt, if not you can disown them! My children love Ghibli stuff. Favourites are Totoro, The Cat Returns, Kiki. They really enjoy the more character-focused stories compared with the American stuff, although Pixar and Dreamworks are still popular! Finally!!! It has been too long since PONYO. I still find it mind blowing that Hideaki Anno (creater of Neon Genesis Evangelion) is voicing the main character. When the creator of something like Evangelion voices the main character in a film you KNOW it's not going to be a kid friendly affair.